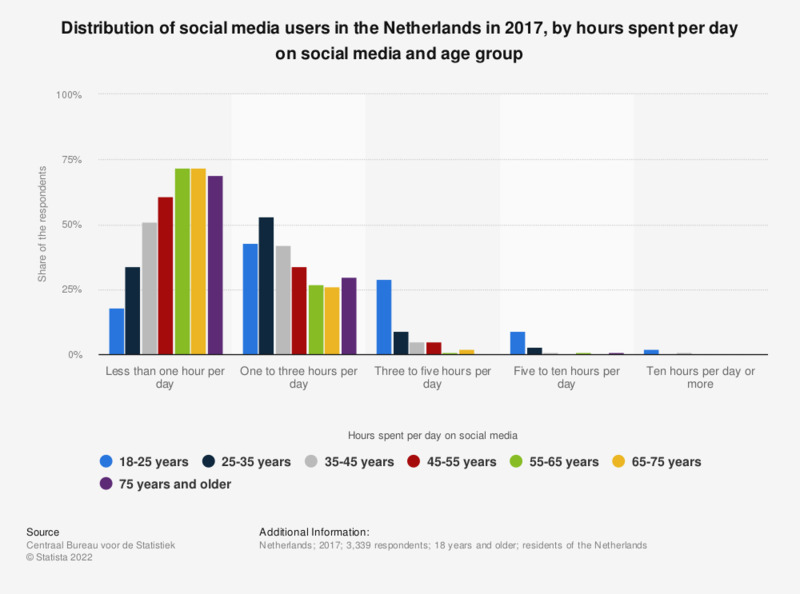 This statistic shows the answers to a survey question on the average daily hours spent on social media in the Netherlands in 2017, by age group. Social media are popular in the Netherlands, especially WhatsApp and Facebook. The number of daily active users of WhatsApp, Facebook, YouTube, Instagram and Snapchat in the Netherlands increased between 2016 and 2017. As of 2018, roughly 11 million individuals in the Netherlands used Facebook. 8.3 million of these used Facebook on a daily basis. When it comes to time spent, especially younger respondents indicate they are active between one and five hours on social media. Relatively new social media platforms like Snapchat are especially popular among younger audiences as can be seen from the growing number of Snapchat users under 40 years old. Because of the growing audiences, online social networks can hardly be overlooked as a marketing tool for Dutch businesses. A large share of Dutch companies is active on social media and investments in social media advertising are increasing. This question was phrased by the source as follows: "Hoeveel tijd besteedt u gemiddeld aan sociale media? Minder dan 1 uur per dag, 1 tot 3 uur per dag, 3 tot 5 uur per dag, 5 tot 10 uur per dag, 10 uur per dag of meer." (in English: "How much time do you spend on average on social media? Less than one hour per day, 1 to 3 hours per day, 3 to 5 hours per day, 5 to 10 hours per day, 10 hours per day or more." The source does not provide any information on the survey type or the exact date of the survey. How often do you check social media for private reasons when you have to do something work-related?